The first step is to enable the CIFS (Common Internet File System) service. Click Services on the left, and then click the button for CIFS. 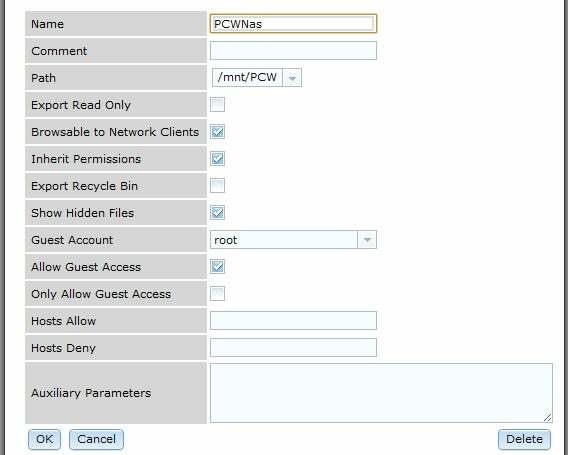 Click the wrench next to the CIFS line to set your workgroup, assign other network and user permissions, or just give your NAS a readily identifiable name. You’ll be typing this name in to access your file server from Windows machines. On the navigation bar at the left, click the tab conveniently labeled Sharing. I’ll set up a Windows share as an example here, but the instructions for Linux and Apple are fairly similar.